This year's star in my Christmas tree was this bauble. Made with very vibrant felt colors, it is impossible not to be noted near the green tree branches! I have offered some of these to my friends, I have taught others how to make it in workshops. The fun part is that you can choose and mix colors as you wish, here is where imagination plays her role. I chose to use the rainbow colors because for me, they are always the most balanced combination of colors. To do them, you simply cut 6 circles of felt 7 to 2 cm – you can also decide the number of circles you want to put and the length of them. Then you start putting the circles one after another, you glue them and in the end you sew a snowflake using white beads! You attach a ribbon and that’s all. Now you have a pretty and simple to make colorful bauble. 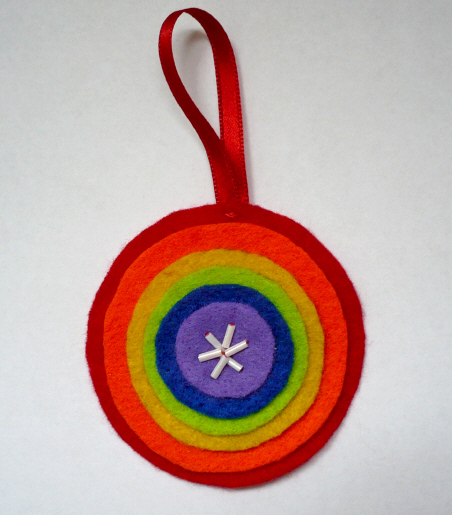 For making this bauble I was inspired by a project from the book “Fa La La La Felt” from a project made by Laura Howard. Copyright © 2010 by Florentina Tudosie. All rights reserved.